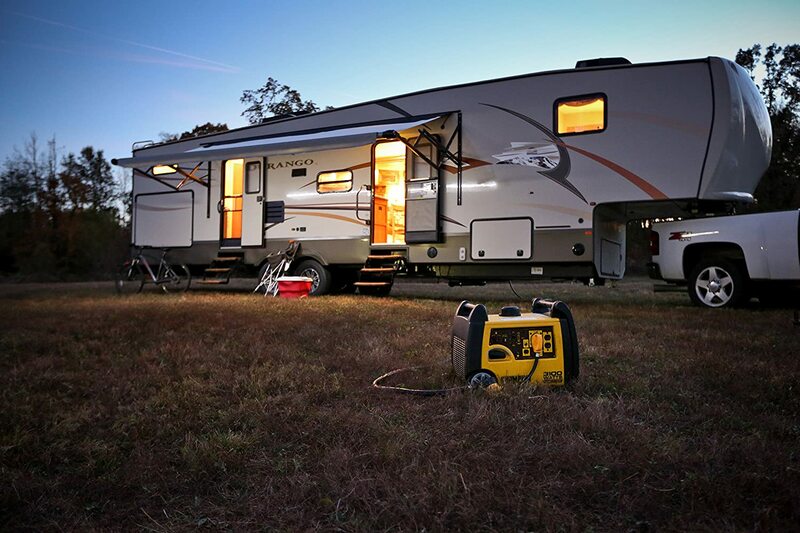 Champion Power Equipment has some phenomenal generators in their kitty but the champion 3100 Watt Portable RV Ready Inverter Generator is easily one of the best from their entire catalog. This generator has several features that make it a great equipment to have when camping or even for regular household use. Read the rest of the review to know more about this unit. The most pleasing thing that you will like about the Champion 75531i how easy it is to move this thing around. When you’re out camping, the last thing you want is to have a hard time moving your generator. Thankfully, Champion put in a lot of thought to make this unit one that is easy to move. It is all but 83.3 lbs heavy. One can always pick it up with a little effort. And there is a handlebar along with a pair of wheels that make it possible to move this generator from one place to another. 2800 Watts while running is no ordinary feat for a portable generator. Despite this significant power, the Champion 75531i is surprisingly quiet. From what I gather, the noise level of this generator is about 59 decibels which is the same amount of noise a normal conversation makes. Granted, it is not as quiet as the premium Duromax or Yamaha generators but it is quite enough to not irritate or bother you at all. However, there is one bad thing about this generator when it comes to sound. The sound made by the generator tends to go up a bit when more load is being put over it by running more appliances and equipment. It doesn’t get unbearable or disturbing but it isn’t serenely quiet either which we would have loved. The Champion 75531i is an inverter generator and just like you would expect from an inverter generator, this too produces clean power. It has a starting wattage of 3100 and running watts measure at 2800 watts. Ran by a 171 cc engine, this generator a manual recoil start process for being turned on. 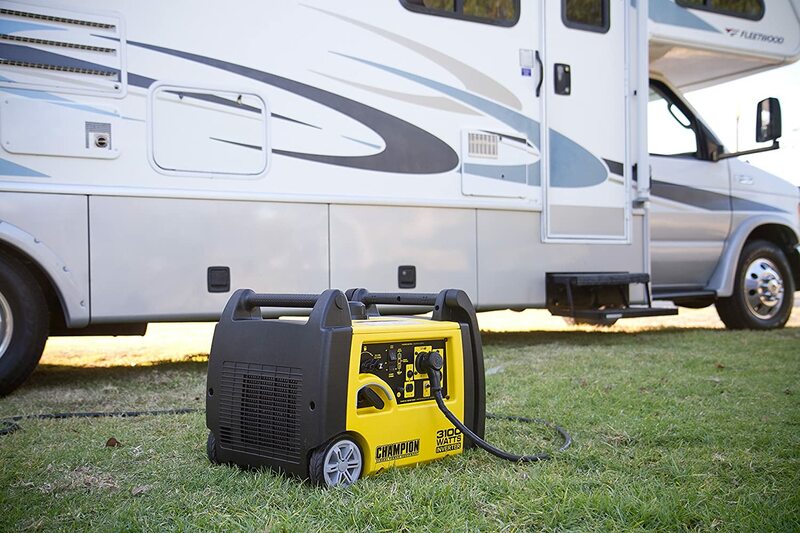 The power capacity along with the rest of the features makes this unit perfect for RV use and camping. It comes with a ready 120 V 30 Amps outlet for RVs and from my research, it runs Air Conditioners of 15,000 BTUs with no complications at all. The engine is well shielded and it was pleasant to find out that this generator runs well in cold weathers too. Along with the Air Conditioner, this can, of course, run the supplementary things too like lights, stereo, etc. If you’re considering a portable generator for your home as safety measures for power outages, then you can also consider the Champion 75531i. Of course, it isn’t as powerful as a home standby generator. But it does a good job nonetheless. I’ve found that this generator is well than capable to run household items like sump pumps, lights, and refrigerator when there is a power outage situation. The Champion 75531i comes with one 120V 30 Amp outlet for RVs, a 12V DC outlet and two 120V 20 Amp outlets for household needs. Apart from having an impressive ability in terms of power generated, the Champion 75531i performs well too. The fuel capacity of this generator stands at 1.59 gallons. This gives this generator a running time of 5-6 hours when most of its capacity under use from running appliances of various kinds. When only 25% of the capacity of this generator is being used, it can run up to 8 hours. The 75531i meets the True Sine Wave specifications thus you can safely trust this generator with sensitive electronics like TV, laptops, etc. which are most susceptible to damage from power overloads. Being a source of clean power and meeting the standards regarding Total Harmonic Distortion to be considered True Sine Wave means that this generator is approved by Environmental Protection Agency (EPA) and California Air Resources Board. Thus you can use this unit across all states including California. There is this great thing about the Champion 75531i that you may never notice but would definitely love once you become aware of it. This generator is equipped with an economy mode which turns on by itself whenever the generator detects that lesser energy is being required by the user. This way you get to save fuel and make the machine run longer from one fill. One thing I personally wish this generator had was a remote control like some of the other Champion models. The remote control is something that definitely makes life easier for campers especially and having one with this already great generator would have been the icing on the cake. That was all about the 75531i generator from Champion. It does have a few shortcomings but that cannot undo the fact that this is a powerhouse performer in its own right. If you can look past the small shortcomings, do consider giving this one a try.